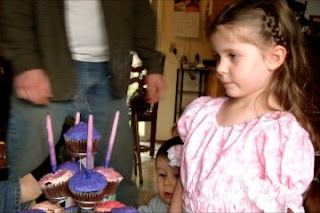 After much anticipation, and with plenty of fanfare and celebration, Alethea turned four yesterday! Somehow it sounds different to say I have a four year old. Four is just different than three. Here are a few pictures from her special day, soon to be followed, I hope, by a birthday letter. My mom and sister Alyssa made her this beautiful prairie girl outfit. Needless to say, she loves it! My other sister, Gloria, made her a lovely poppy garland. 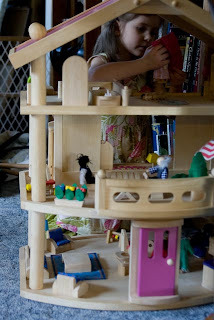 Erik and I gave her a treasure hunt, with this dollhouse at the end. (We found it on Craigslist in December, and were so excited to finally get to give it to her!) My parents gave her a tiny family of dolls for Christmas, and now they have a home. She is having so much fun with this, and I love to listen to her play. 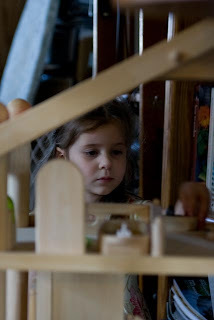 She keeps saying "My dollhouse is the best thing Daddy every gave me!" Every year I make her a "poppy dress". 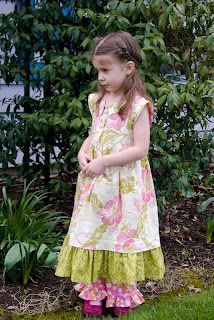 Here is The Poppy Dress #4. I really love how this one turned out. I've liked them all, but this one may be my favorite. I love how feminine and sweet it is, and the whimsical touch the bloomers add. You can see the rest of The Poppy Dresses here. Happy birthday my sweet, sweet Poppy! I love you my girl. May God bless your coming year and grow you in His Love! p.s. Beca, this dress is so beautiful! I wish I could sew! I'd love for my girls to dress like this! How adorable she looks.... that prairie dress was wonderful too! What a blessing your mother passed that knowledge on to you girls! She is so beautiful! Happy birthday, sweet girl! I love the dresses; they are beautiful. Happy Birthday! What sweet photos, and I agree, that is a lovely poppy dress. By the way-you are an amazing seamstress! I love the dresses you and your sister and mom made. Did they have a pattern for the prairie dress. I want this summer for my family to make ones's for my children and need a pattern for them to follow. Where did they get the pattern? Doll house looks very EXQUISITE too. You have a very beautiful daughter. Hope to see in several weeks. These two weeks are going to be crazy with church functions and we are leaving early tomorrow for Portland for three days. Let's see, what do I comment on? The beautiful birthday dress, the precious picture of your girl in the prairie costume, the sweet poppy garland, or the fantastic craigslist find? My goodness sakes!!!! !